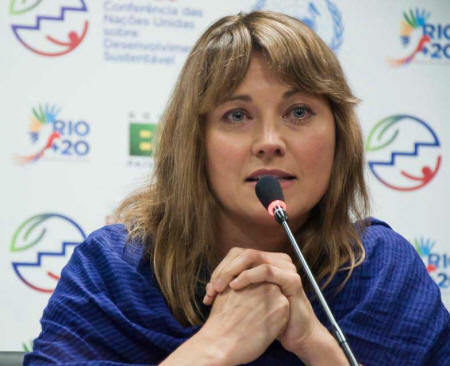 AUSXIP Lucy Lawless | Greenpeace Campaign To Have Arctic Region Declared A Sanctuary by United Nations. he Arctic is rising - Are you with us? In February with six others I found myself crouched in darkness with a team of Greenpeace activists, preparing to occupy a Shell drillship bound for the Arctic.I was suppressing the urge to run for the hills, to leave the greenies to it and go back to being a mother in the 'burbs. But that very fact - that I am a mother - was also the reason I was there and thinking of my kids hardened my resolve. By the time we came down four days later, 130,000 people had joined us in calling for the Arctic to be protected from reckless oil drilling. Since then a global tide of opposition has been building, and today I am in Rio de Janeiro, Brazil at the Rio+20 Earth Summit to launch the next phase of the campaign. There's a real feeling here that as world leaders fail us again, we need to rise up and take matters into our own hands. I'm here with Kumi Naidoo, the head of Greenpeace International, and Sir Richard Branson to do just that - we're launching a bid for a global sanctuary in the Arctic. We believe the home of the polar bear, narwhal and Arctic fox should be protected on behalf of the entire world and I want my children to grow up in a world where the polar bear still lives! So we've added our names to the Greenpeace "Arctic Scroll" and I want you to join us! When we have a million names, Greenpeace will embark on an expedition to plant the scroll in a capsule on the North Pole seabed - 4km below the ice. It will be a collective statement on behalf of humanity. The rapidly melting Arctic should not be seen as an opportunity for exploitation, but as a warning that we must act now. Clean energy, not extreme oil. is our future. It's time to make a stand for our kids and grandkids. PS Wondering what a narwhal is? Find out here. For the full list of actors and actresses, musicians, environmentalists, polar explorers and business leaders who have already signed the Arctic Scroll, click here. You can join them! 19 - High Arctic Sanctuary Campaign Petition Reaches 957,699!